When it comes to family-friendly beach party fun, no-one does it better than Club Med. From early morning activities to late night dancing under the stars, G.O.s (gracious organizers) engage G.M.s (gracious members – that’s us) in non-stop fun at this all-inclusive family resort, situated on the balmy shores of the Pacific Ocean, 161 miles north of Acapulco. Getting there from Los Angeles is a breeze – it’s a three and a half hour direct flight from LAX. In addition to regularly scheduled flights on Alaska Airlines, new resort packages with non-stop charter service from LAX to Ixtapa-Zihuatanajo International Airport are available May 5 – Aug. 11, 2012. Flights depart from LAX at 10:30 a.m. every Saturday, and leave Ixtapa the following Saturday. At Club Med, which opened its first village in 1950, you indulge in all the activities, gourmet food, drinks (full open bar too) that you can handle for one all-inclusive price – plus airfare to Ixtapa in a current promotion. On my recent visit with friends to Club Med Ixtapa Pacific, we were greeted cheerfully by G.O.s, who represent more than 25 nationalities at each Club Med village (there are more than 80 worldwide). G.O.s are what distinguish France-based Club Med from other all-inclusive resorts. These friendly, multilingual young people interact with guests, called G.M.s throughout the week, often at mealtimes, creating a close-knit family camp environment. Don’t be surprised to hear your kids saying ca va, hola and graciaswithin a day or two. We settled into our brightly-colored, hacienda-style, oceanfront suites in the Sol building, a collection of luxurious couple and family units with private deck, concierge services, breakfast room service, complimentary Internet service and direct beach access. The village also has comfortable family rooms with garden views but minus the personal services. But with so much to see and do in the village, you’re barely in your room anyway. When traveling with my family, I sign up my kids in the children’s program pronto so they can have fun with their peers and G.O.s (with whom they bond quickly). There’s a complimentary Mini Club for ages 4 – 13, and Juniors program for ages 11 – 17. There’s also a Baby Club (four – 23 months) and Petit Club (two-three years) for an additional fee. Depending on age, kids go sailing, kayaking, swimming, play archery and tennis, and learn tricks on Club Med’s signature flying trapeze – a must do for adults too! G.O.s also engage kids in scavenger and pool games among other activities. To get in the groove of the “Club Med culture” (how else to describe the endearing camaraderie among G.O.s and G.M.s? ), I lap up land and water sports with abandon. Our group toned up with salsa dancing, water aerobics, and exercise classes. We also took archery, kayaking and sailing lessons. 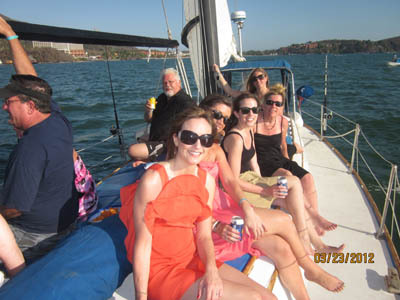 “If you see dolphins, it brings good luck,” said our Brazilian sailing instructor. In our tennis class was a mom named Amy who has been visiting Club Med villages with her two daughters for years. “I’ll be sad when they outgrow the children’s clubs. They have so much fun and it gives me time to take classes,” she told us. Club Med also offers excursions for a fee. We took two: a relaxing sunset cruise and a snorkeling tour to nearby Ixtapa Island. Sans electricity and with little water, the island is a throw back in time with quaint beach cafes offering fresh guacamole, pico de gallo, fish tacos, cheese quesadillas, and beer served in an ice bucket. Afternoons were siesta time. We wiggled our toes in the warm, silky sand and sipped cool mango margaritas and pina coladas. The ocean is a comfortable temperature with gentle waves ideal for body surfing (even for seven-months pregnant Katie, a colleague and former G.O. now working for corporate Club Med). Most relaxing was a comfort massage (my best ever!) at the spa. Mealtimes in the four open-air restaurants are a treat. El Encanto serves an international breakfast, lunch and dinner buffet with made-to-order omelets. Miramar, open for late breakfast, lunch, snack and sometimes dinner (the rib-eye steak is mucho tender), has a beach-side bar. Luna Azul exudes a romantic ambiance. Just for kids: Sirena, a rainforest-style eatery. 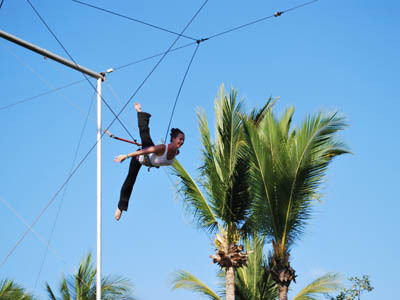 Nightly entertainment starts at 9 p.m. spotlighting G.O.s singing, dancing and performing trapeze acts. No evening is complete without Club Med’s signature “crazy signs” group dance moves that inspire kids and adults to clap, twirl and sing under the stars. On departure day, G.O.s gather in the courtyard once again, this time for a grand send off – until next time. For more information, visit www.clubmed.us. Mimi Slawoff is a monthly columnist for L.A. Parent magazine and writes for the Los Angeles Convention and Visitors Bureau. For more travel stories, follow Mimi on Twitter @mimitravelz.